How many goals will we concede? I don’t recall seeing Van Dijk lose one. Just a small correction, Finnan wasn't at Liverpool anymore in 08/09. Those stats are probably from 07/08. Also, are the goals and appearances columns swapped around? I'm sure I would have remembered Carra scoring 55 times in 0 appearances! Clearly there was a formatting mismatch when I copied this from wiki to the forums. Common sense would dictate it's 0 goals in 55 appearances. 19 assists from full back positions so far. Robbo 10, Trent 6, Millie 3 (when he played full back). Another clean sheet. While we’ve worried about the attacking performances, it’s gone quietly unnoticed that we haven’t conceded a goal for four games, over 360mins of football. This equals our longest run of the season, but also includes games against United and Bayern. Edit: apologies - it is our longest run without conceding. I was looking at October, but mistakenly included the Napoli away game as a clean sheet, which it was. For them. A great young spine ! We currently have conceded 15 goals, so barring the unlikelihood of going the next ten without letting a goal in, we won’t be equalling the best defensive record in the top flight. But I’d hope the aim is still no more than 20 goals. That would be brilliant, and no less than Alisson and Van Dijk deserve. Van Dijk may have been the talk of the season in our defence but these two had been spotted to be one of the best pairing in the league, operating opposite side of each other. 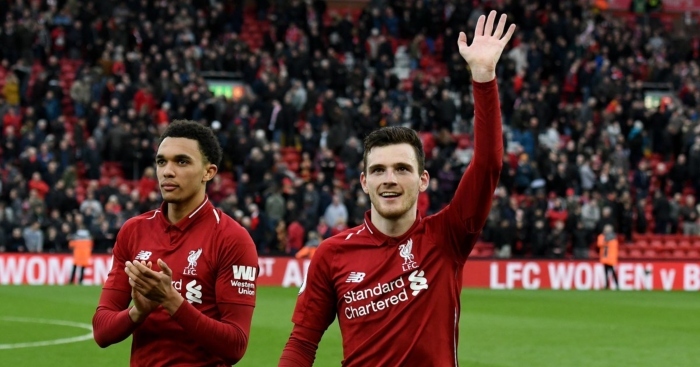 Virgil van Dijk and Sadio Mane have attracted most of the plaudits for Liverpool in recent months - but Andy Robertson and Trent Alexander-Arnold once highlighted their importance in the crucial win over Tottenham.